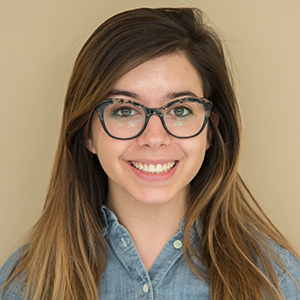 A number of tech-savvy consumers have already configured their homes to some degree of automation, such as by using mobile apps to start their dishwashers or adjust their thermostats. 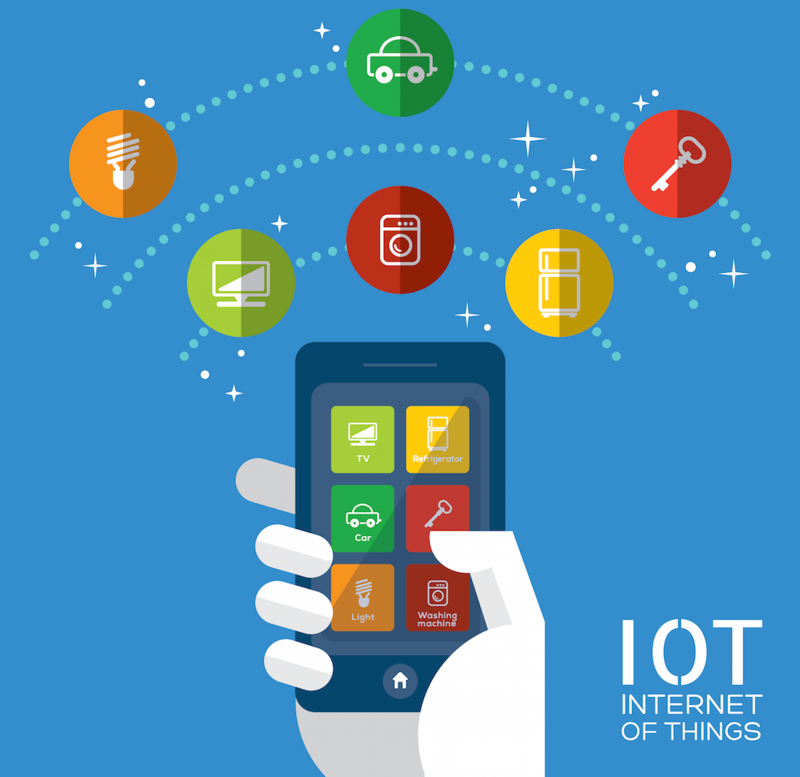 A relatively new phenomenon, the Internet of Things (IoT), also called the “Industrial Internet” or even the “Internet of Everything”, takes these simple automated tasks to the next level by enabling objects to communicate data with connected devices. Eventually, IoT as we know it will progress from simple home and building automation to more advanced application areas. In the ideal Internet of Things, mobile devices will be able to collect and interpret data such as your location and known preferences, and communicate with “smart objects” — without requiring your input at all. While driving past a billboard on the highway or watching a commercial on television, data collected by your devices shows that you like the type of product being advertised and you are automatically messaged with more information. Not only can your car parallel park, but it can navigate and drive on its own. Similar improvements to trains and aircraft are just a few of the ways that IoT can help us get around as technology progresses. Medical devices automatically administer medications and monitor patients’ conditions as well as their overall well-being. Pacemakers, hearing aids, and heart monitors streamline medical care by communicating with doctors and patients. Sensors optimize energy consumption by powering lights and electronics based on a person’s activity. On a larger scale, an improved IoT helps monitor water and air quality, among other environmental concerns. IoT sensors monitor the structural stability of bridges, railways, and waste management systems for safety and security. With the wide use of smartphones in our society, the Internet of Things has an easy way to collect and use our personal data to communicate with objects and smart devices. But to get a jump-start on making IoT possible, we need to create the next generation of mobile technology to optimize smartphones. 5G is the chosen moniker for the next generation of wireless communication, of which a new version is released about every ten years. 5G is currently just a concept, but it is expected to be implemented by 2020 — giving the mobile industry a lot of work to do in a short amount of time. A decreased latency of under one second. Increased data rates of at least one gigabit per second for tens of thousands of users simultaneously. Whatever improvements are made to wireless communication by the release of 5G, the main goal is for mobile technology, data collection, and wireless communication to be more seamlessly integrated through speed and efficiency. Without these features, the Internet of Things won’t work correctly and will be redundant. Among the many developments researchers from across the globe are already working on for 5G, the optimization of mobile device antennas is an important topic to study. Though 5G applications have not been standardized yet and many researchers are developing a range of devices to expand the world of IoT, we can start by looking at a basic introductory model showing how to design a small antenna in a mobile device in our Modeling of a Mobile Device Antenna tutorial. 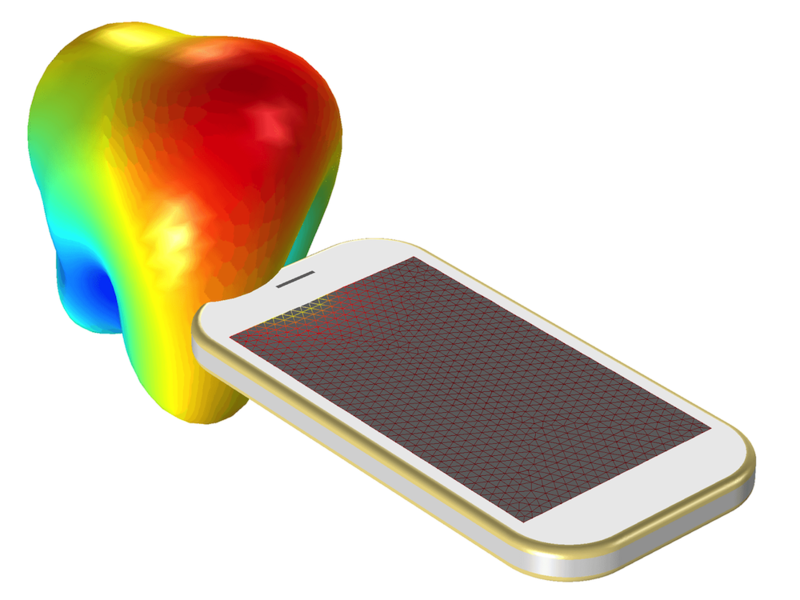 A mobile device antenna must be small and lightweight enough to fit in the limited amount of space allotted for it in a smartphone’s design. Planar inverted-F antennas (PIFA) are a good choice for mobile communication because they are small, powerful, and efficient. These antennas can cover multiple frequency bands for cellular devices, WiFi, and Bluetooth® technology — which makes them a great choice for IoT compatible objects and devices. 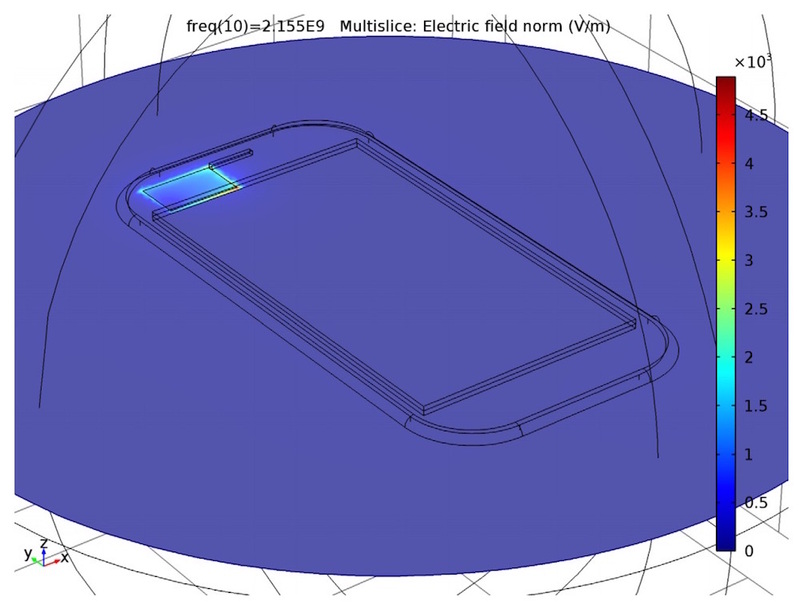 The mobile device antenna simulated in this tutorial includes a 4G device made up of a PIFA on a PTFE block with an FR4 circuit board, ABS housing, and glass with a composite silicon substrate. 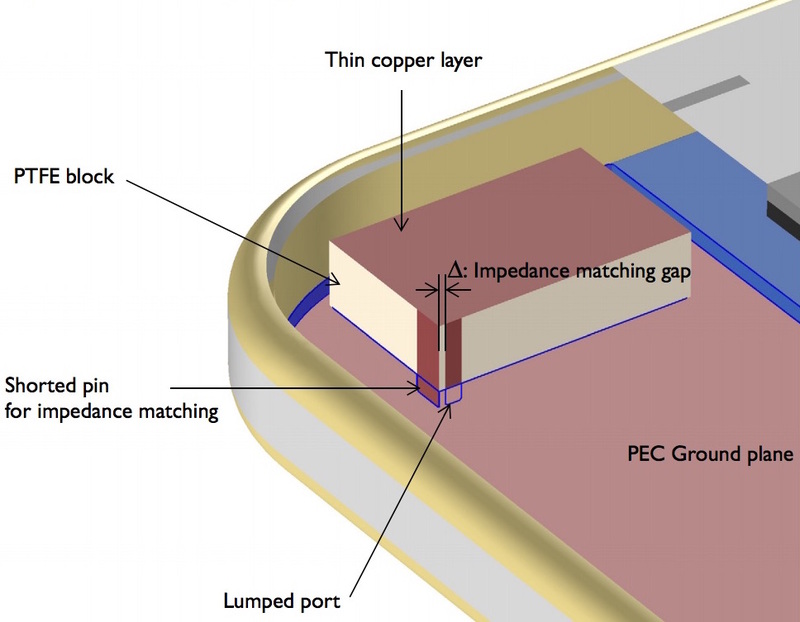 The antenna itself is made up of the PTFE block with a thin copper layer for high conductivity, a lumped port between a perfect electric conductor (PEC) ground plane and feeding strip, as well as another strip shorted to the ground plane and adjacent to the feeding strip for impedance matching purposes. It also includes an impedance matching gap that matches the antenna to the reference impedance of 50 Ω. Model geometry of a planar inverted-F antenna in a mobile device. For the simulation, this antenna can be modeled using PEC boundaries because of the low downlink frequency range. The losses on the metal are inconsequential due to the high conductivity of the copper layer. The PIFA is modeled in a spherical domain that is enclosed by perfectly matched layers (PML) to absorb its outgoing radiation. The lumped port, with a reference impedance of 50 Ω, is used to excite the PIFA and evaluate its input impedance. Through simulation, we are able to calculate the field distribution plot for the PIFA. Results show that the field is strong at one end of the metallic surface at the top of the model, far from the feeding strip. These measurements actually resemble those of a quarter wave monopole antenna, a design from which the PIFA is derived. Results plot of the electric field distribution at the top of the PIFA. The simulation also calculates the polar-formatted far-field radiation pattern. The azimuthal radiation pattern is no longer omnidirectional since the antenna is now miniaturized and located on only one corner of the ground plane. 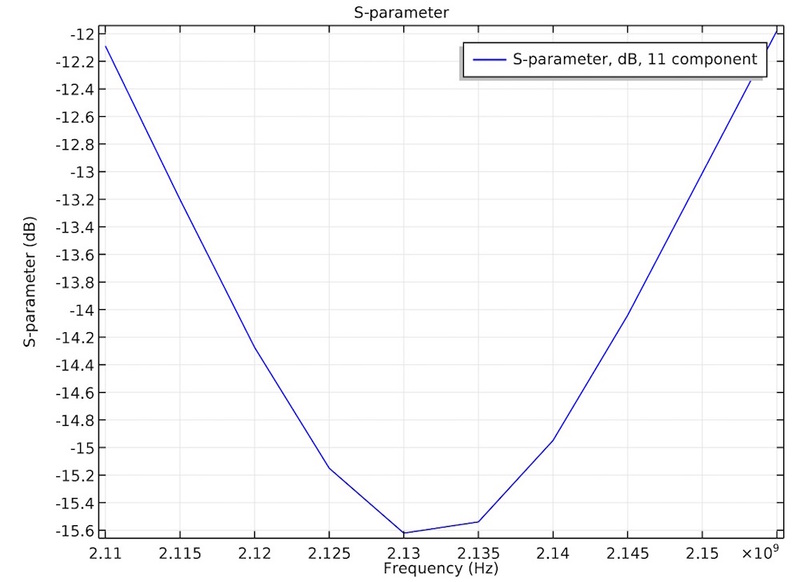 From the S-parameters, we can see that the voltage standing wave ratio (VSWR) is less than 2:1. This means that the antenna input impedance is well matched to the reference impedance, which is a typical measurement in network analyzers and other common measurement systems. The S-parameters of the given AWS downlink frequency range are calculated. Going beyond the results of 2D far-field calculations, you are also able to review the simulation in a 3D radiation pattern to show maximum radiation and null. The far-field radiation pattern of the PIFA plotted in 3D. To address 5G applications, there are many developments to be considered above the introductory model. In order to handle higher data rates, the operating frequency has to be increased to a millimeter range from which we can achieve a wider bandwidth. This will result in higher path loss between transmitters and receivers, so antennas need to provide higher gain to reach a longer distance. However, this will significantly reduce the covering range in terms of angle because the radiation pattern will be very sharp. Consequently, phased array antennas are required to get over the limit of angular dependency of high-gain antennas using the ability to steer a radiation beam toward wanted directions. By optimizing the design and performance of mobile device antennas, including those just mentioned, the ideal Internet of Things will be here before we know it, and we’ll be ready to embrace the new technology.